Now that we’ve got the color match we can complete the finish. I then spray the top coats. I start by lightly spraying in alternate patterns. Horizontal then vertical, and then switching to diagonals to get the most even coverage. I shoot 2 to 3 coats a day then sand with 320 grit wet or dry, being careful not to sand through the color coat. Lacquer and other top coats follow, they don’t fill. That means that the lacquer will flow into the depression not fill it up. 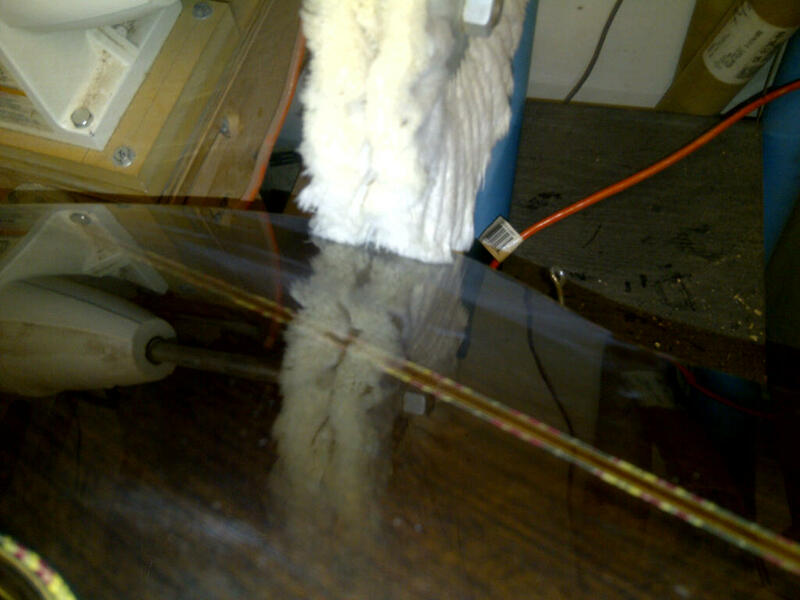 By sanding in between coats you are taking off lacquer on the surface while not touching the depression. The next time you spray, the depression will be that much smaller. I usually spray between 6 and 9 coats to get the desired result. Prep work is critical because the less depressions and holes you have the less you have to finish. When I’m satisfied with the raw finish I let it dry for a minimum of 2 weeks to allow the finish to cure and shrink. When the finish is dry, it’s not a simple mater of putting the guitar together. The finish has to be compounded to smooth out the ripples. Compounding is going through a series of abrasives until the surface is smooth and mirror like. I start with no lower grit than 600 wet or dry and usually 800 grit. I use the best quality paper. 3M Imperial wet or dry seems to work well. The cheaper papers have larger stray grit in them and can cause scratches that are almost impossible to remove. This is also the case if you start with anything coarser than 600 grit. The first sanding is the most important. I lubricate with water to float the particles off and for less loading of the paper. It’s very important that you use a hard rubber, cork or felt pad to be sure of a flat surface. Never sand with you fingers. I make sure all the gloss is taken off so that the surface is dull but smooth and uniform. Now I switch to Micro Mesh. This is an abrasive in cushioned latex that doesn’t build up as easily and is very high quality. The 1500 grit is equal to 600 grit sandpaper so I start with the next one up, 1800. I continue with this to 4000 grit also using water as a lubricant. Then I switch to another abrasive, Abralon. This is a 6″ pad I use with a 5″ random orbital sander. Using 2000 and proceeding to 4000, I use these pads dry. 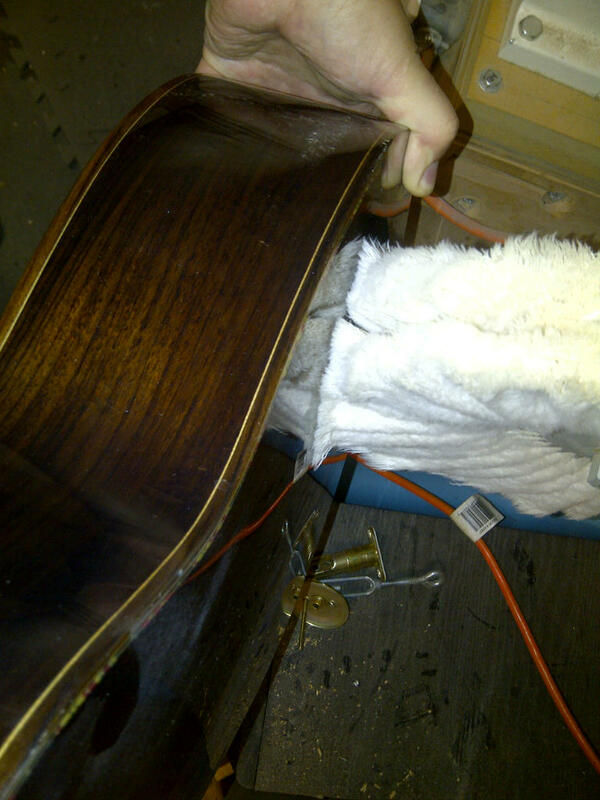 I leave the 6″ pad full size to protect the guitar from the rubber pad on the sander. In tight corners, I use the pad by hand. One thing to remember is to clean off all the previous slush so that the next grit starts fresh. Now the fun part, using a buffer to bring the gloss up! In reality all you are doing in each step is to make the scratches finer and finer until they appear to go away. I use a Shop Fox buffer and 12″ domet wheels. I make sure not to contaminate the compounds with the wrong wheel. While they make several grades, I stick with the fine and extra fine. If you use the buffer like this you will run the risk of catching the upper surface and having your piece thrown to the ground. I believe you will not like the result much so be aware of your orientation. I do the same thing with buffing that I do with sanding, changing direction of the piece’s orientation with the wheel: horizontally, vertically, and diagonally. When finished with the fine wheel, clean the surface of the piece to clean the previous compound then proceed to the extra fine. Wax is not recommended and will in fact make the piece duller. When you’re done you should have a mirror finish to be proud of. This entry was posted in Advanced Guitar Repair, guitar building, Lutherie and tagged bolt on neck, electric guitar, Finish, Guitar finishing, guitar neck, guitar repair, Lutherie, lutherie school, The Fret House by Geiger School of Lutherie. Bookmark the permalink.